One giveaway ends and another one begins! Lucky you again. This one is for the little Miss's and is a great addition to any young girl's hair accessory stash! Dots & Daisies are regulars on the market circuit, you may have already met the lovely ladies behind the brand for yourself. Not only can you meet them face to face regularly at our markets but they are also an online boutique full of gorgeous non-slip hairclips and accessories for girls. Their products are direct from Ribbies Clippies in the USA and are new to the Australian market. The clips are covered in grosgrain ribbons and have a unique colour co-ordinated foam insert which prevents slippage (even in the finest hair). We desperately need some for Miss Spice, who has a habit of letting hair clips slip right out of her hair into the great abyss! Dots & Daisies clips are comfortable and easy to use. No tangled hair, no slippage and stunning designs and patterns. Big girls can wear them too, we can attest that a friend of Sugar & Spice wore them as a type of brooch attached to her frock during a recent girly night out! 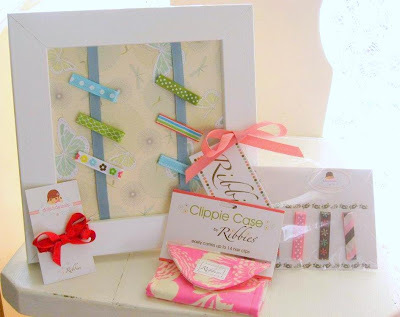 Up for grabs in our wonderful Dots & Daisies online giveaway is a pretty Aqua Butterfly Clippie Holder, 6 gorgeous clips (including an Ava gift set and a lovely red bow) plus a pink floral clippie purse. All you have to do to enter in visit the Dots & Daisies online boutique, browse their gorgeous range and come back to this post and leave a comment here telling us what your favourite Dots & Daisies piece is. The winner will be drawn at close of business on August 31 2011. Only Australian residents can enter. My favs are the headbandsbut I also think how wonderful and clever the clippie purse is, great idea. The entire range is all very nice. I love the Grace Dots clippie pairs! Such a gorgeous feminine design! I love how you can browse by different colours! Some of my favourites are the brown and pink ones. I have twin girls and can't wait for them to come home from hospital and dress them up all pretty! The clippie purse is such a great idea!! I really like the fabulous school range. I really love the cute little Clippie Purses!! These guys are geniuses! I am always losing my daughters clips. Their clip holders would have to be my favourite product, as not only do they have a practical job of holding clippies, they also would look gorgeous on any little girls room. Art with function, I love!